Centre Associate Fellow Dr Thomas Ryan has published the first edited volume on animals in social work. This follows his 2011 Palgrave Macmillan publication Animals and Social Work: A Moral Introduction. In Animals in Social Work: Why and How They Matter, Dr Ryan, a social worker now in his third decade of fulltime practice, has procured contributions from seasoned social work practitioners and renowned academics. Dr Ryan argues that the invisibility of animals in social work practice and literature for much of the discipline’s history underpins the common assumption that this is perfectly consistent with both social work’s function, and its raison d’etre. Remarkably, this state of affairs is belied by the ubiquitousness of animals in the social world within which social workers practice. 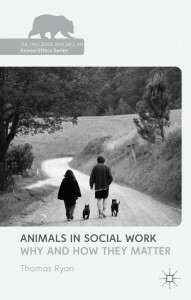 Dr Ryan’s edited volume serves as a timely corrective to this almost routine indifference and dismissal, and focuses upon two key questions – why and how do animals matter to social work? The various contributors address these questions persuasively and compellingly, by way of theoretical and moral arguments and practical applications. In doing so, the essays address but nevertheless extend the discussion well beyond animal-assisted therapies, critically focusing social work attention upon the wellbeing and welfare of animals in and of themselves as key moral and social justice concerns.